Thanks to DECnet-Linux on my Ubuntu 14 boxes, DECnet on OpenVMS on a couple of SIMH VAX servers and DECnet on RSX-11M PLUS on a SIMH PDP-11/24 server, it is eminently possible to kick the Internet Protocol (IP) completely off a local LAN and use DECnet for logging in and sharing files across these machines. Windows was the missing piece, and I decided to throw an Windows NT 4.0 server into the mix. 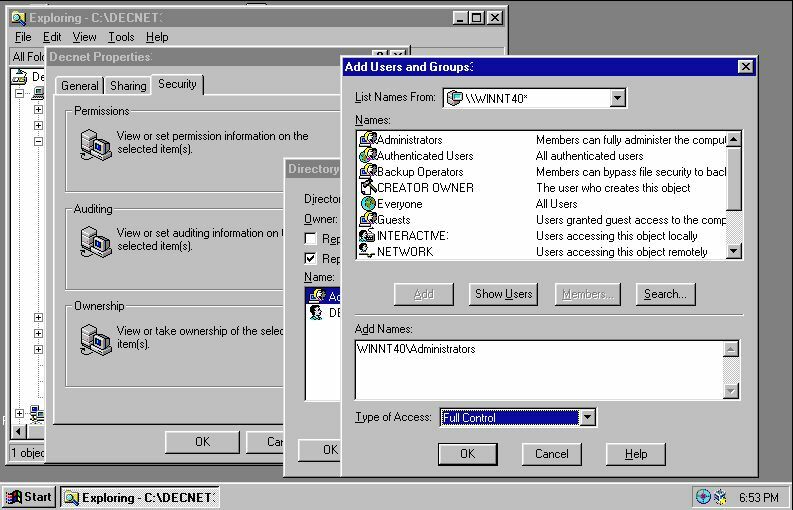 I could have chosen Windows 2000, XP, or later - but there is a certain charm in NT4 service-pack 6a + post 6a security rollup - a charm only felt by folks dated to the 8-bit era like me. 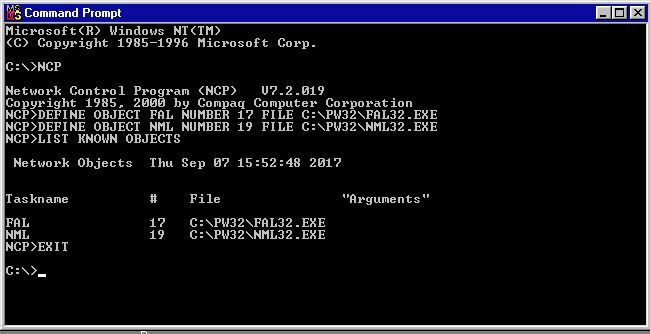 The saga of sharing files over DECnet from Windows NT 4.0 starts after I had DEC Pathworks 32 v7.4 up and running on my NT 4.0 workstation. At this point, ENTEE4 (DECnet address 1.557) is happily talking DECnet with two other nodes around my lab, as validated using tshark sniffing on the DECnet-dedicated network from Ubuntu 14 boxes equipped with DECnet-Linux (DECnet addresses 1.553 and 1.554). Everybody is saying hello to everyone else and it is a happy little island world. 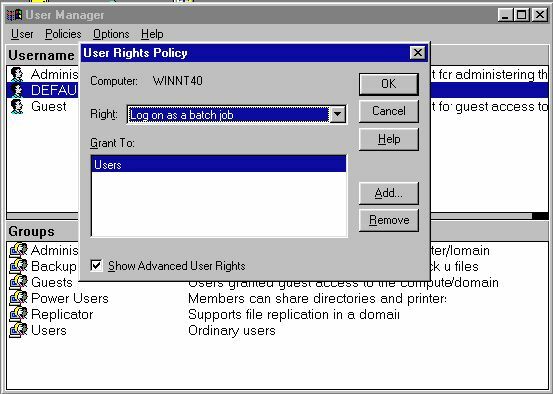 From the menu bar at top of User Manager, choose Policies -> User Rights. This will pop up a "User Rights Policy" window. Click on the little checkbox at the bottom saying "Show Advanced User Rights"
From the "Right" drop-down list in the upper area, choose "Log on as a batch job"
Click "Add..." in the bottom right area. This will pop up another window titled "Add users and groups". Choose "Users" in the "Names" area at the top (scroll down to see "Users"). Click on "Add" button in the middle. This will add "<computer-name>\Users" in the white text area in the bottom half. Click "OK" at the bottom. You will back at the "User rights policy" window. Click OK.
You will be back at the "User Manager" window. From the top menu, click User -> Exit to exit out. Second step - I created a user called DECNET with home directory C:\DECNET and added this user to the "Users" group that we manipulated previously. The DECNET user thus has the all-important "Log on as a batch job" right. From the menu bar at top of User Manager, choose "New User...". This will pop up a "New User" window. Fill in the username (DECNET), provide a password that you can remember, and clear all four check-boxes. Click on "Groups" at the bottom. In the "Group Memberships" window that pops up, the user should already be a member of the "Users" group; therefore no more action here. Click on OK to return to the "New User" window. Click on "Profile" at the bottom to open up the "User Environment Profile" pop-up. In the "Home Directory" section in the lower panel, change "Local Path" to "C:\DECNET". Click on OK to return to the "New User" window, and OK again. 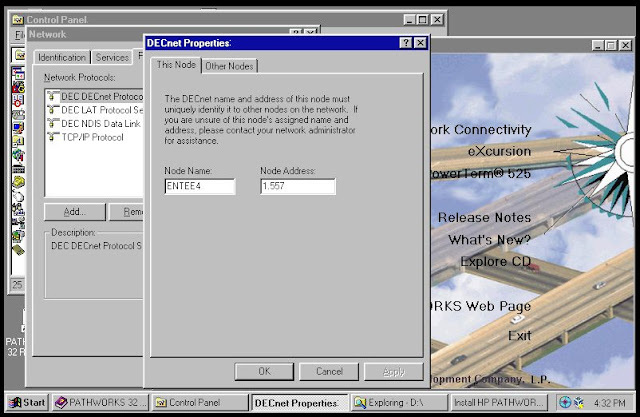 From Start -> Windows NT Explorer, Right-Click on the DECNET folder under C: drive. In the "Add Users and Groups" window, choose "Administrators" in the "Names" area at the top half, and click "Add" in the middle. This will add "<computer name>\Administrators" to the "Add Names" area in the bottom half. In the "Type of Access" drop-down list at the bottom, choose "Full Control"
Click on OK, OK and OK to exit out of the three open screens. That's it; now the C:\DECNET folder has full access permissions for both the owner DECNET as well as Administrator group accounts. 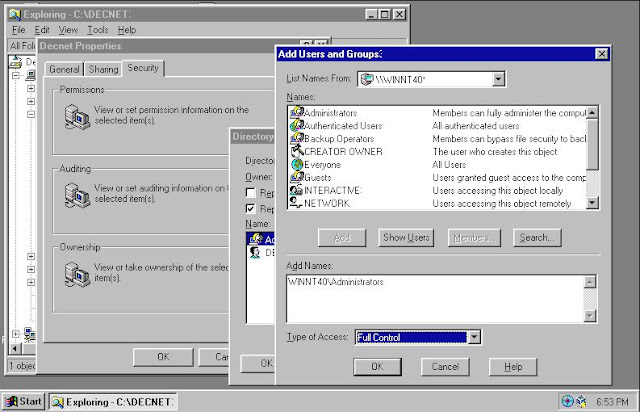 Fourth step - configure FAL and NML services on Windows NT 4.0 Pathworks using Network Control Program (NCP). 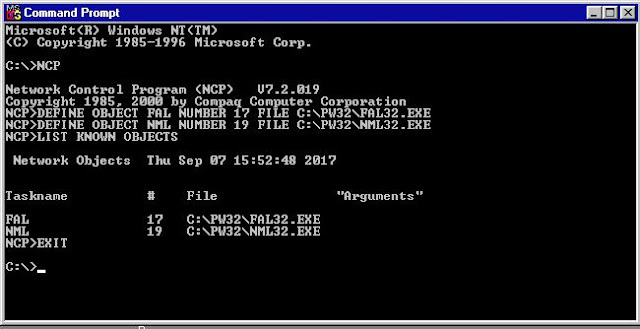 To do this, open a MS-DOS command prompt and issue the command "NCP" to enter the NCP prompt. Then issue NCP commands to define the File Access Listener (FAL) and the Network Management Listener (NML) objects. Keep in mind the object numbers 17 and 19 cannot be changed; they are specifically allocated to FAL and NML objects. Log out of the Windows Administrator account, and log in as DECNET. Create a file called INFO.TXT in C:\DECNET to play (i.e. test) with. | Digital DEC (Compaq) Pathworks. It speaks IP and DECnet. 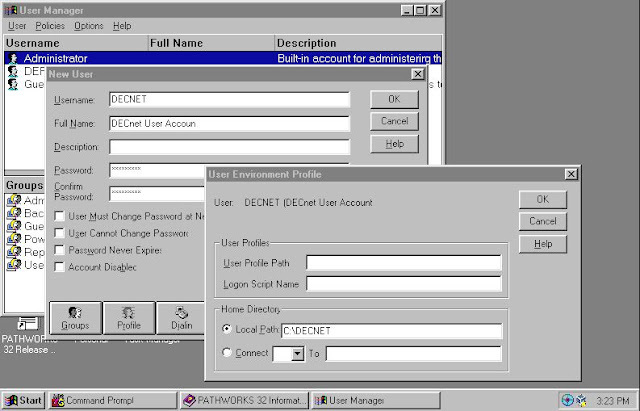 That concludes my experiment with a DECNET account shared using FAL server object over DECnet on a Windows NT 4.0 server running DEC Pathworks 32. Please share your experiments and results in the comments below!